English grammar is hard, whether you’re a native speaker or someone learning it as an additional language. 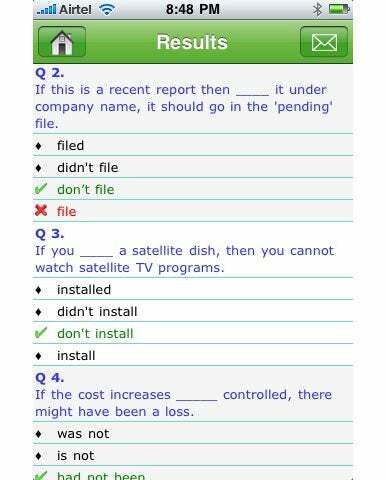 Eknath Kadam’s Grammar Up app lets you use your iPhone or iPod touch to refine your grammar through a series of multiple-choice quiz questions. It works, but suffers from some serious design failings. Primarily designed to help you prepare for English proficiency tests such as TOEIC, Grammar Up features 1,800 multiple choice questions spread across 20 different categories. The categories cover just about every topic I could imagine. From adjectives to conjunctions, from adverbs to word families, they’re all there. You can set the number of questions you want on a particular test, in addition to picking a category or a “mixed test” with questions from various categories. There are a couple of neat touches here: If you find your grammar skills wanting, you can shake your iPhone to give up and move to the next question. You can also put your finger onto the screen while a question is displayed and drag it downward to reveal the correct answer hidden behind the question. I appreciate the cross-training nature of the mixed quiz, but would have appreciated a slightly more advanced mode where you could forego the multiple-choice prompts and directly enter answers for questions which have only one possible correct answer. Once a test is complete, you’re taken to a screen which lists out all the questions and their correct answers and shows you how well (or poorly, as the case may be) you did. For the answers you got wrong, it points out both the answer you chose and the one you should’ve chosen. An e-mail button on the top-right corner also allows you to send those results to others — or to yourself for archival purposes. Grammar Police: Grammar Up’s Results screen is simply laid out and populated with all the right answers and points out the ones you got wrong. The app’s progress meter keeps track of all the questions you’ve answered correctly across all sections of the application and displays your scores accordingly. It also allows you to click on any of the progress bars and answer all the questions from that section that you’d previously gotten wrong. I wasn’t thrilled with the design of the app, which seems to use a lot of custom buttons and graphics rather than the standard table cells and selection mechanisms we’ve come to expect from most iPhone apps. For instance, when you answer a question, it momentarily appears as though the button on the following screen is selected. And when you tap the gear icon, there’s an awkward and slow animated transition standing between you and the settings screen. Using the standard interface might sacrifice some personality, but it would have made the app faster, more attractive, and less awkward to use. Grammar Up does what it sets out to do rather well. The questions the application displays are well-rounded and intelligent, the answers are all correct, and the sheer size and variety of the collection is amazing. Despite the app’s design weaknesses, you’d be hard pressed to find another quiz application on the App Store that matches up to Grammar Up. Grammar Up is compatible with the iPhone and iPod touch, and requires iPhone OS 2.1 or later.